Come join us on a week of deep relaxation and joy, self discovery and sharing. Eugenia and Julie will be sharing their experience in and love for women’s work through Iyengar Yoga tailored to the needs of women and Women’s Circles. 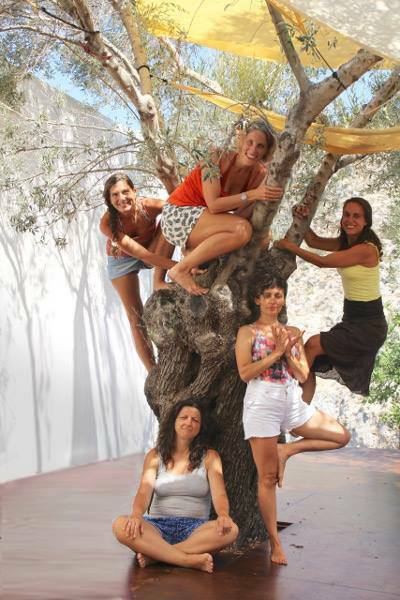 They started collaborating at YogaOnCrete in 2015 and have since supported each other in their journeys as women through participating in each other's work, sharing and holding space for each other as friends, and celebrating the smaller and larger joys of life as sisters. 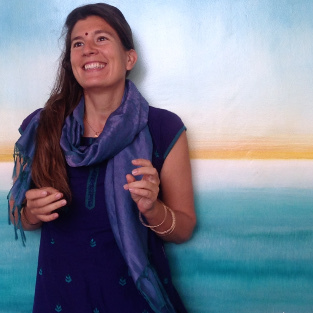 They will be sharing their own experience of how leading a yoga lifestyle, practicing the teachings of this ancient art, and becoming more aware of and tapping into the power that lies dormant in each woman's feminine cycle, has supported them in leading happier, more aligned with their values and essense as women, and more fulfilling lives. During the retreat, you will also have the chance to swim daily in the cool, turquoise Mediterranean waters at quiet beaches, explore the idyllic unspoilt surroundings of the area of Chora Sfakion, and be nourished by wholesome local food cooked with love by our wonderful cook Maria! Each day at the retreat includes a meditation and Women's yoga practice based on the Iyengar yoga tradition in the morning to open your heart and body, and connect with the sourse of vitality from within, and a Women's Circle in the late afternoon. There will also be the possibilty for authentic greek cuising cooking classes on three of the afternoons. The retreat will awaken your deep knowing and intuition, so that you will find your path and walk it, supported by like-minded women from across the world. You'll experience a deep sense of relaxation and alignment with your body, your womb, your calling, your past, your future, your lineage, your pleasure. Our aim is to support each woman to tap into the authentic strength and joy that lies within the softness, tenderness, nurturing, intuition, playfulness, wisdom, sensuality, wilderness and rage of our feminine nature. We’ll find a deep holistic trust in our own potential and life. And we’ll celebrate the gift of this life we have been given! Each week begins with an opening circle and introductory Women's Circle at 6.00 p.m. on the day of arrival, followed by dinner. All other days will begin at 8 a.m. with a 30 minute meditation, followed by the 1.5 hour Iyengar yoga class focusing on women's needs. After breakfast guests are free to relax and enjoy the beach and sunshine, receive a massage treatment or private session with Julie, or explore the village and region. In the late afternoon is the two hour Women's Circle, and the day's programme closes with dinner. The fourth day of the week is a rest day from classes; guests can join in an optional excursion, including a guided hike through the magnificent Aradaina gorge (approx. €25 depending on number of participants). All breakasts and 5 dinners are offered at the house, while on two of the nights guests are free to dine out in the village restaurants (not included in the course cost; approx. €15 for a full meal including drinks). Individual excursions (e.g., hikes, boat trips) can also be arranged at an extra cost. On the last day, departure can be arranged after morning class and breakfast. The number of women participating is limited to 14, to create a warm and friendly atmosphere, to ascertain that individual attention is given in the sessions and to create a safe and supportive group dynamic. The morning practice with Eugenia, Iyengar Yoga teacher and YogaOnCrete hostess and owner, will start with a 20-30 minute meditation and end with a long relaxation. We will use the prescious elements of alignment and focus on detail of the Iyengar yoga style to approach asana practice, and will look at how the body can feel free and open, when allowed to experiment, flow, and be breathed into. Through the practice we create a more bright, centred, spacious awareness of our being so we enter everyday life more confident, true to oneself, and happy. We will uncover the vitality and joy that is present in the body when we slow down, listen to its needs and make space to receive its wisdom, while we will also look at the body's natural potential for physical and emotional healing. For women in particular leg-work is important to ground and connect to mother earth, and set the base for a dynamic pelvic floor, which is an essential condition for the spine to unfold, extend and grow, symbolically also creating the ground for this unfolding and growth to happen in less tangible parts of our lives. Another area we will be focusing on is the wonderful potential of an alive belly (the centre of our womb, our life-force and energy), where the forces of earth and sky meet and can be balanced. Eugenia will also offer particular practices for menstruation and menopause to balance and contain hormonal and emotional fluctuations. Whether you have a menstrual cycle or have passed menopause, these phases apply to the subtle energies that affect a woman and her creative potential throughout life. If you're experiencing (pre-)menstrual pain, menopausal, fertility or sexuality issues, you're likely to find release, opening and a way forward. Women's circles are a beautiful safe and supportive space to share, practice listening with compassion, allow yourself to follow your heart and be held by a group of like-minded women. When we drop our guard and allow our vulnerabilities to show, we experience how we all share the same basic needs and longings, masked by tensions, insecurities, and fears. This simple act of sharing creates an amazing connection and sense of freedom from our suffering. On some afternoons before the Women’s Circle you can join authentic Greek cuisine cooking classes with our excellent, intuitive and super creative cook Maria, another powerful woman of the YogaOnCrete team. Her warm nature and dedication to her spiritual practice, shines through her wonderful dishes (every week there is at least one guest who wants to take Maria back home with them!!). In combination with fresh, pure ingredients (many from organic local farms), her food is happy food, even for persons who are not accustomed to a vegetarian cuisine. During the cooking classes, which will as a whole be a practice of awareness, rather than learning recipes, you will have the opportunity to practice sourcing wonders from your own intuition and creativity. The classes will depend on participation, so if interested please ask for details! 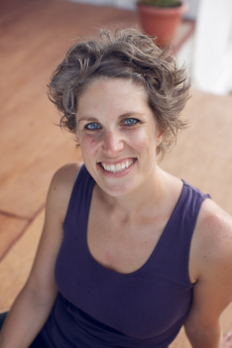 She gained a Yoga Teacher qualification from the Sivananda Yoga Vedanta Centres in Spain in 2005 and in 2012 received her Iyengar yoga teaching certification. She attends workshops with teachers who continue to inspire her, namely Constantinos Giannetakis, Donna Farhi, and Angela Farmer. She is currently living with her husband, Nikos, between Crete during the retreat season and Rhodes during winter.